Boston Media Makers meeting, WEDNESDAY MAY 3th, 2017, 5 – 8 PM, at Casa Verde Jamaica Plain. We had a really fun meeting at Casa Verde in Jamaica Plain for our May meeting. Some regulars came along with some new people. It was fun spending the time mingling over beers and tacos. Josh Bernoff said, “Best meeting I’ve ever had in a bar.” What a great compliment. 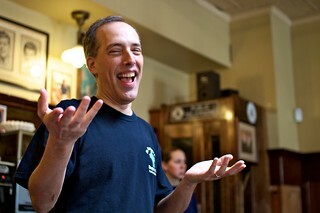 One always enjoyed the mingling part of our Boston Media Makers meetings and that what we did. Some great connections were made. We’ll be taking the Summer off, and meeting again on October 1st at Doyle’s. See you then! We joined Lord Hobo Brewing Co at Casa Verde, Jamaica Plain for a tap takeover. Join us in May before we take our Summer break. After the May 3rd meeting, we’ll be off until October. We connect people who’d benefit from knowing each other. We’ve been meeting since JANUARY 2006 and every meeting is different. It’s exciting to arrive and find new people who are there to share their story and hear about others. This group is unlike any other because everyone gets to meet everyone else in a laid back environment. Join us if you are creative, or interested in learning about new things. Some topics that people have recently shared include self publishing on Amazon.com, new ways to shoot and share video, and pointers to interesting events happening around Boston. Read about our meeting in this great Jamaica Plain news article by Chris Helms. Boston Media Makers is a monthly meet-up for media enthusiasts in the Greater Boston Area. We are social media enthusiasts, filmmakers, journalists, web geeks, technologists, designers, artists, entrepreneurs, and people just wanting to learn more about making and distributing media online. Come talk shop and share current projects. We learn, get inspired, and collaborate. Hosted by Steve Garfield. GROUP DESCRIPTION: Everyone is welcome! The BEST thing about this meeting is that everyone who attends, gets to meet everyone else. I love how it has expanded. Every month is a new experience with both returning friends and new attendees. Boston Media Makers Page on Facebook. Can’t make the meeting? Follow us on Twitter, Hashtag #BMM. The twitter stream starts getting useful at 10:30. Next Boston Media Makers meeting, SUNDAY MAY 7, 2nd, 2017. 10 AM at Doyle’s Cafe in Jamaica Plain, MA. SUNDAY! SPECIAL SPEAKER: J. Bruce Jones, The Book Guy, on how he sells over 4,000 books on Amazon.com each year! 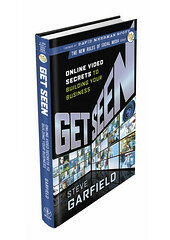 Bruce has helped many people create and sell their books online, including a few members of our group. We’ve been meeting for 10 years and every meeting is different. It’s exciting to arrive and find new people who are there to share their story and hear about others. This group is unlike any other because everyone gets to meet everyone else in a laid back environment. 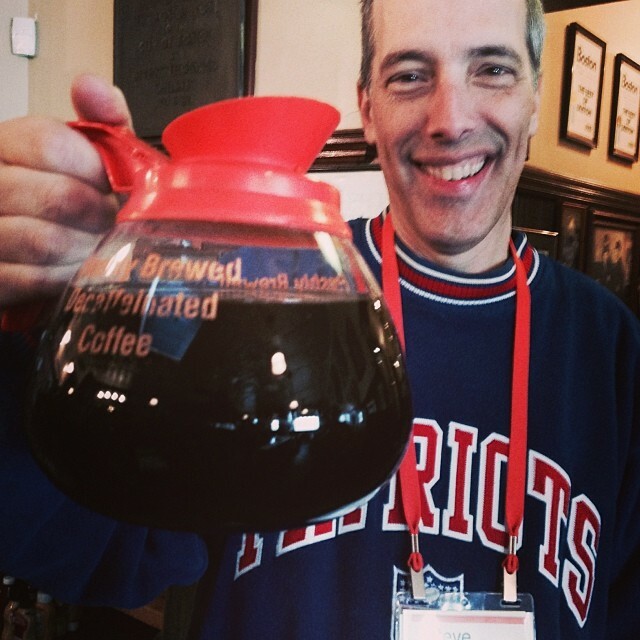 Boston Media Makers is a monthly meet-up for media enthusiasts in the Greater Boston Area. We are social media enthusiasts, filmmakers, journalists, web geeks, technologists, designers, artists, entrepreneurs, and people just wanting to learn more about making and distributing media online. Come talk shop and share current projects. The guest presenter is YOU. Everyone gets three minutes to share, pitch, promote, or ask questions. We learn, get inspired, and collaborate. Hosted by Steve Garfield. – What do want to do? – Do you need some help? – You can ask questions too. – Come with a prepared show and tell if you like. Each person takes about 3 mins to explain what they are doing, are interested in, or asks a question. Also you can do a simple show and tell. Some people bring cameras, accessories, all kinds of things. We prefer no sales presentations. Breakfast is available for ordering. Towards the end have the bill go around and people pay for what they ordered an leave a nice tip. Bus Route 42 – Forrest Hills Sta – Dudley or Ruggles Sta.via Washington St.
Lots of Free Parking in our 3 parking lots! Next Boston Media Makers meeting, SUNDAY APRIL 2nd, 2017. 10 AM at Doyle’s Cafe in Jamaica Plain, MA. SUNDAY! Next Boston Media Makers meeting, SUNDAY MARCH 5th, 2017. 10 AM at Doyle’s Cafe in Jamaica Plain, MA. SUPER BOWL SUNDAY! We had a full house and a great time sharing stories. Boston Media Makers Meeting Report 12/4/16 It’s Holiday Sweater Time! NEXT MEETING: FEBRUARY 5th, 2017. Note: No meeting on Jan 1, 2017. We meet, grab a free coffee or tea, stay standing, mingle and chat, then at 10:29 promptly we sit down and do roll call on video and then go around the room and share who we are, what we are workign on, going to, experimenting with, giving around 120 – 180 seconds per person with a duck timer to keep people honest, and then wrap up around 12:02 PM with hugs and merriment and perhaps a malt beverage at the bar? 12/4/16 – It’s Holiday Sweater Time! Mingling is first. Everyone chats. No sitting! Free coffee. Great meeting with a wonderful group of interesting people. Next meeting: December 4th. Wear a Holiday Sweater! 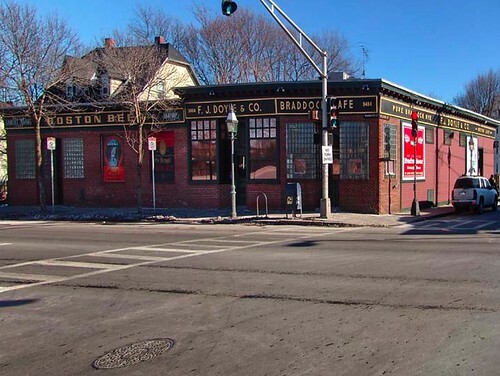 Next Boston Media Makers at DOYLE’S CAFE is NOVEMBER 6th. Jeff Cutler explains how this works. Meet, grab a tea, stay standing, mingle and chat, then at 10:29 promptly we sit down and do roll call on video and then go around the room and share our current projects and rants, giving exactly 120 seconds per person with a duck timer to keep people honest, and then wrap up around 12:02PM with hugs and merriment and perhaps a malt beverage at the bar? Sounds fantastic!